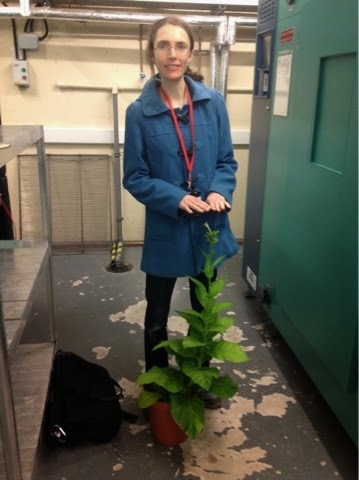 Science as a destiny: My Brilliant 'Bonsai' Tobacco! I must admit, it was with some trepidation that I agreed to my supervisor's plan for my second attempt to bulk up the seeds of my model parasitic plant - Striga gesnerioides - using a susceptible tobacco host. In my first go, the tobacco were grown in the controlled environment rooms, where the climate is set to resemble the tropics. They thrived under such treatment and grew to nearly six foot, but sadly, the parasites failed to survive long enough to flower and set seed. 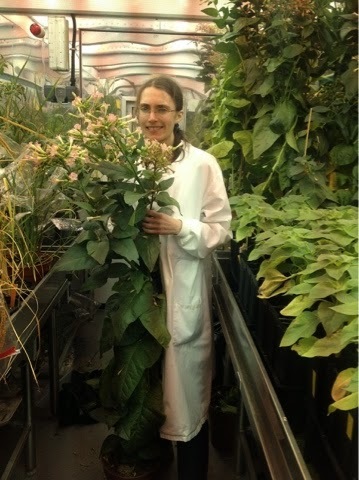 My supervisor declared that it had probably been just a bit too hot in there, so this time I was to grow them in my growth cabinet, where I could keep the temperature much cooler. My growth cabinet is...well...not very big. Positively TINY in fact, if you are trying to squash in six foot tobacco. My first tobacco plants, in the controlled environment rooms. But, I was assured the plan would work - 'We've done it before, years ago! '- so germinated several seeds and selected four healthy seedlings to transplant into big, Striga-infested pots. And I waited and watered them and watched nervously as they rapidly stretched towards the ceiling. Then - stop! The tobacco plants abruptly stopped growing and burst into flower. In plants, flowering is a key 'decision point' and marks a transition from vegetative to reproductive growth. So they are not going to get any bigger. ( Although some plants produce inflorescences on the side of their stems, each flower head is considered as a separate stem - once the meristem produces a flower, it will no longer grow taller). I was amazed! It was as if they simply knew that they were in a smaller cabinet this time. Plant intuition? And it seems, small IS beautiful...for my parasites at least. 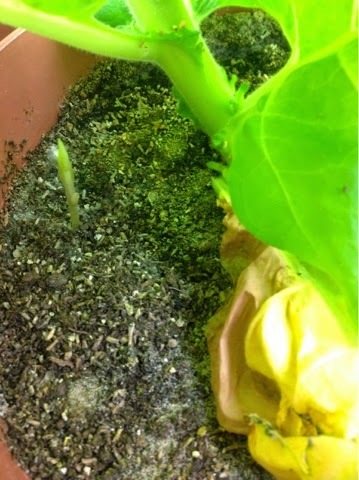 A single Striga shoot has erupted in one of the pots. I could believe it when my supervisor gave me the news as I had only checked them myself three hours before. It's a shame I didn't leave a camera running as it must have been a dramatic breakthrough! I can only hope it is the first of many. Fingers crossed! I hope there will be lots more - the first Striga gesnerioides shoot to emerge.